Respiratory therapists have long called them ‘frequent flyers’ — COPD patients who get sick, go into the hospital, get well, go home, get sick again, go back into the hospital, ad infinitum. Something needs to be done, and now it is. In hospitals all across the country, a new role called the COPD navigator is popping up to ensure patients receive not just appropriate care to treat their acute exacerbation, but also the education and follow-up care they need to keep another one from happening. In many places, those new jobs are going to RTs. At Palos Health in Palos Heights, IL, an RRT COPD navigator is now visiting every patient who comes into the hospital with a diagnosis of COPD. “The patient is given preliminary education and is seen by the navigator on a daily basis until discharge,” said Respiratory Care Services Manager Anna Molsen, RRT. Part of the process involves making the patient and his or her physician aware of the services available through the hospital’s heart/lung clinic. Most of them end up coming to the clinic post-hospitalization, where they can receive additional education from RRTs and RNs and even enroll in the facility’s pulmonary rehabilitation program. But even if the patient doesn’t go to the clinic, the navigator still keeps track of their progress when they go home, following up at three days and 14 days post-discharge. She says the role has grown so much that she’s now looking at expanding it to have the navigator also visit COPD patients residing in skilled nursing facilities. Patients are identified via a computer query on a shift-by-shift basis and the pulmonologist reviews patients with the navigators on a weekly basis. RT navigators have been in place at Erlanger University Hospital in Chattanooga, TN, since September of 2014, according to Respiratory Care Clinical Manager Terry Ellis, Jr., BS, RRT. The overall goal: helping patients gain the self-management skills they need to manage their conditions at home. Bill Cohagen, MSHCA, RRT, FAARC, manager of respiratory care services at Salem Health in Salem, OR, started evolving his navigators three years ago from oxygen discharge planners. These therapists are empowered to schedule the discharge physician visit and provide education on everything from medications to lifestyle choices. They also perform follow-up calls, set the patient up with pulmonary rehabilitation when possible, and even score the patient for level of COPD. Other hospitals are not quite as far along but they’re doing their best to get there. At Providence St. Vincent’s Medical Center in Portland, OR, Respiratory Care Manager Wendy Castro, MS, RRT-NPS, is working with her colleagues to reorganizing the way COPD patients receive care using a multidisciplinary team and an RT driven protocol. “We are hiring three inpatient COPD navigators and one outpatient RT to meet with patients in the home setting for re-education, measuring compliance, and assessing patient safety and ability to care for themselves in the home setting,” Castro said. Gwen Hesselman, BS, RRT, director of respiratory care services at Mercy Medical Center in Dubuque, IA, is currently engaged in a joint effort with the director of home medical equipment aimed at developing a navigator-type program. “This is a multidisciplinary team with my in-house therapists taking on the education lead with those patients that are admitted with exacerbation,” says Hesselman. At HaysMed in Hays, KS, a new focus on COPD admissions is driving enhanced educational services. “We do a complete educational booklet with them upon admission and during the stay to ensure they have a better understanding of the disease and how to live with this disease,” said Kathy Weaver, CRT. Patients who qualify are also referred to pulmonary rehabilitation. Even hospitals with limited resources are getting into the act. Reinert found educational materials and made folders of pertinent information for COPD patients seen in the facility and her RTs take the time to educate them on the use of their respiratory inhaler medications and the need for a proper diet and exercise. Michael Nay, MBA, RRT, senior director of respiratory care services at Novant Health in Kernersville, NC, has been overseeing a COPD navigator program for nearly four years now, and he’s learned a thing or two about how these programs can be tweaked to maximize their impact. While the data showed a nearly 40 percent increase in patient knowledge of their disease process and their medications, all-cause readmissions did not drop. The team regrouped in early 2015 to complete a gap analysis and revisit workflows, with results suggesting the transition from acute to post-acute care was the problem area. “With this realization, we transformed our program to truly embrace the spirit of a health care navigator role,” Nay said. Using the hospital’s integrated EMR, RT navigators were charged with providing education and support to COPD patients throughout their continuum of care. Today the system has nine full time pulmonary disease navigator positions at eight acute care facilities and those navigators are also available for telehealth referrals from physicians, specialty providers, and community health partners. Maida Lowery, RRT, is a COPD navigator at Kaiser Permanente in Los Angeles, CA. As such, she works on the outpatient side to reinforce techniques taught on the inpatient side by respiratory therapists who serve as COPD educators. 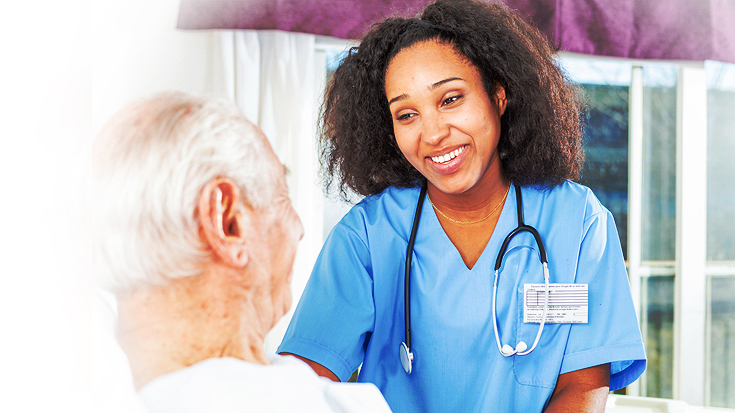 In addition to offering tobacco cessation services, the team provides educational videos patients can watch online, bedside education on medication technique, pulmonary rehabilitation assessments, oxygen testing and management, and information on how to communicate with the COPD Care Team. It’s all part of the hospital’s commitment to health and wellness for people with COPD. “We are continuously updating the physicians in different disciplines regarding efforts to keep our members healthy and available resources to better manage their condition,” she said. She has no doubt she and her fellow RTs are the right people for the job.